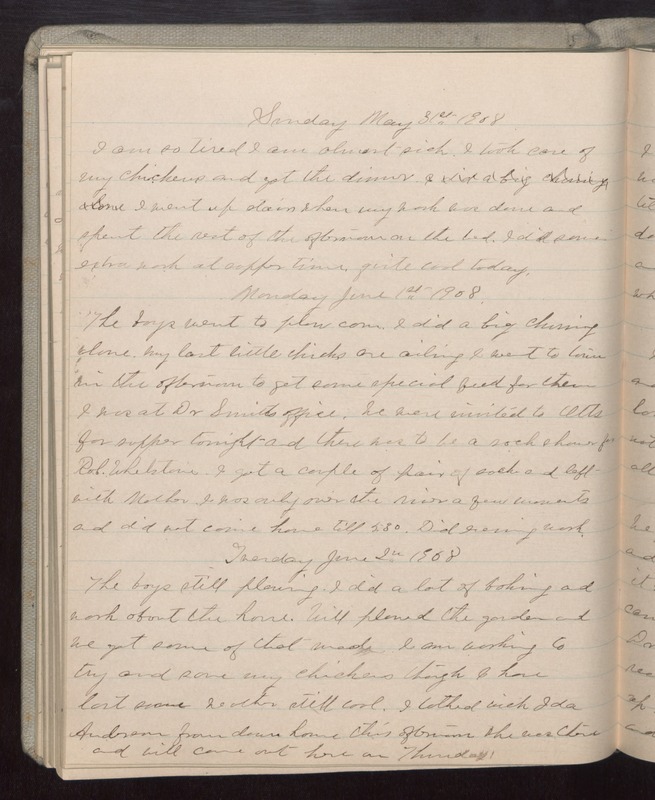 Sunday May 31st 1908 I am so tired I am almost sick. I took care of my chickens and got the dinner. I went up stairs when my work was done and spent the rest of the afternoon on the bed. I did some extra work at supper time. quite cool today. Monday June 1st 1908 The boys went to plow corn. I did a big churning alone. My last little chicks are ailing I went to town in the afternoon to get some special feed for them. I was at Dr Smiths office. We were invited to Otts for supper tonight and there was to be a sock shower for Rob Whetstone. I got a couple of pair of socks and left with Mother. I was only over the river a few moments and did not come home till 5.30. Did evening work. Tuesday June 2 1908 The boys still plowing. I did a lot of baking and work about the house. Will plowed the garden and we got some of that made. I am working to try and save my chickens though I has lost some Weather still cool. I talked with Ida Anderson from down home this afternoon she was there and will come out here on Thursday.